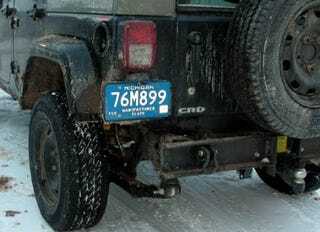 If there's anything like consensus among Jeep fans, it's that a CRD version is long overdue. Sure, you can get all the 2.8-liter, common-rail turbo-diesel Jeeps you want, so long as you're outside US airspace. We know the day will come when the new smoggers arrive on these shores, but is that day near? Do these shots, seen on GreatLakes4x4.com indicate Jeep's ready to pull the trigger (and hey, is that green one a Gladiator pickup in disguise) ? Well, not exactly. These are most likely military vehicles built for export. Back into the waiting room with you, scalliwags!